Japanese traditional dance, which many people in the west recognize as Kabuki dance, has been performed for more than a few centuries. Each piece of the Japanese traditional dance has its own predetermined music and choreography. They are usually long pieces, like those of classical ballet of Western traditional dance. JPA performs short pieces of the Japanese traditional dance as well as our originally choreographed pieces along with some of our selected contemporary music from Japan and the West. Depending on the occasions, if requested, we can provide brief explanations before the dance performance, such as about the forms of Japanese traditional dance, use of body wearing kimono, etc. Some of the characteristics of Japanese dance are quite unique and apply exceptionally contrasting body use methods compared to Western dances. Such pieces of knowledge might be very interesting for the audience to know before watching the performances. Please contact us if you are interested in inviting us at your event. Thank you! JPA participates in cultural events of NYC area and other regions. Towards these performances, we constantly rehearse many of our dance repertories, such as traditional pieces and our original contemporary Japanese dance arrangements. If you are interested in joining our rehearsal sessions, please select from the categories below. Evaluations for your suitability shall be done for your level. Please contact us for more details. Traditional Japanese Dance: Classic dance and music pieces created hundreds of years ago passed down to generations. 4-6 hours/month of rehearsal sessions are required. Original Contemporary Japanese Dance: Original dance pieces are newly created at JPA with contemporary Japanese and western music. At least 12 hours/month of rehearsal sessions are required. 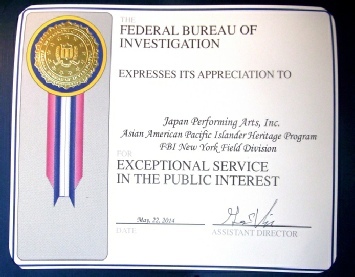 We performed at the New York Field of Office of FBI on the May 22nd 2014. Our performances were classical Japanese dance called “Fujimusume” and Yuko Hamada’s original dance piece “Shishi (Lion).” We received great applause. Nihon Buyo kai is a recital show of Nichibu dance students. The event is to show each student’s effort and progress. Nichibu dances are mostly performed solo. Each student is performing a dance piece of approximately ten minutes for the event. There is also a summer version of Nihon Buyokai called Yukatakai exclusively done within the inner circle. 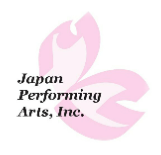 JPA’s 2019 Yukatakai will be either in June or September, and the recital will be in 2020 at some timing between March through May. Please come to see the recital when the date is finalized. The announcement will be made via Facebook and on our website. For the beginners, weekly one-hour morning class with its maximum capacity of four students iAs provided in a Midtown Manhattan location. All the students dance to the same dance piece. One and half years before the recital, each student determines a dance piece and learn its choreography. For the intermediate level, weekly two-hour class with its maximum capacity of six students is provided at locations in Brooklyn, Long Island City, etc. All the students dance to the same dance piece. One and half years before the recital, each student determines a dance piece and learn its choreography. These are classes/rehearsals mainly for the dancers who already internalized a certain level of Nichibu dance moves and try to master the classics as well as creative pieces with the perspective of actually performing at our staAge shows. The members join in weekly four hour classes/rehearsals.